The Jain University School of Engineering and Technology (JUSET) Bangalore is one of the reputed Engineering and Management colleges of Bangalore. This college was established in 2005. It offers B. E/B. Tech, M. Tech, and Diploma courses. 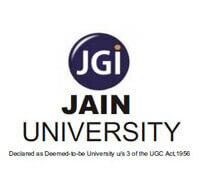 The Jain University School of Engineering and Technology (JUSET) Bangalore is an AICTE recognised college of engineering. The Jain University School of Engineering and Technology (JUSET) give quality education to students through modern laboratories, library, sports, research facilities, and clubs. Admissions in the Jain University School of Engineering and Technology are done on the basis of applicant’s score in the KCET 2018 exam. The applicant should have appeared in the IIT JEE Mains 2018 Exam which is scheduled to be held in April 2018. He/ she should have a minimum aggregate of 45% marks. In case of the reserved category candidates, the minimum score should be 40% aggregate marks. Admissions in the M. Tech courses are done on the basis of applicant’s score in the GATE Exam 2018 or Karnataka PG-CET 2018. The GATE qualified students are required to appear in the Personal Interview directly for admissions.